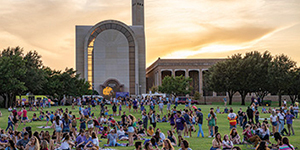 ACU is a diverse, welcoming, academically rigorous community redefining what it means to be a Christian universityin the 21st century. 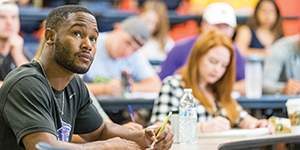 ACU’s undergraduate Engineering program is accredited by the Engineering Accreditation Commission of ABET, abet.org, the global accreditor of college and university programs in Applied Science, Computing, Engineering, and Engineering Technology. ACU is a selective four-year private university deeply rooted in Christian values and fueled by innovative teaching. Here you will be challenged intellectually while developing spiritually, all in preparation for successful Christian service and leadership. Our Engineering and Physics majors pursue a deeper understanding of thephysical world through theory, application, analysis, and practical design. Their education comes under thementorship of a dedicated Christianfaculty who are active researchers intheir fields. They are respected internationally for their work, and with an average class size of 10 students, you’ll get to know your professors well. We admire God’s handiwork in thelaws of the universe and seek to understand and apply those principles to solve big problems while improvingthe lives of people around the world. To learn more about ACU, schedule a campus visit at acu.edu/visit. ACU Wildcats compete in 17 NCAA Division I sports in the Southland Conference. 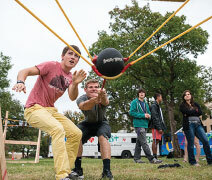 Nearly 25% of graduating ACU seniors have studied abroad in places such as Europe, Asia, Latin America, and Africa. 100 percent of 2016–2017 Engineering and Physics graduates were employed or enrolled in graduate or professional school within six months of graduation. Engineering and Physics students work and study at premier national (Los Alamos, Fermi, Brookhaven) and international (Max Planck Institute, Germany) laboratories. 100 percent of 2017–2018 ACU Engineering students passed the Fundamentals of Engineering Exam.